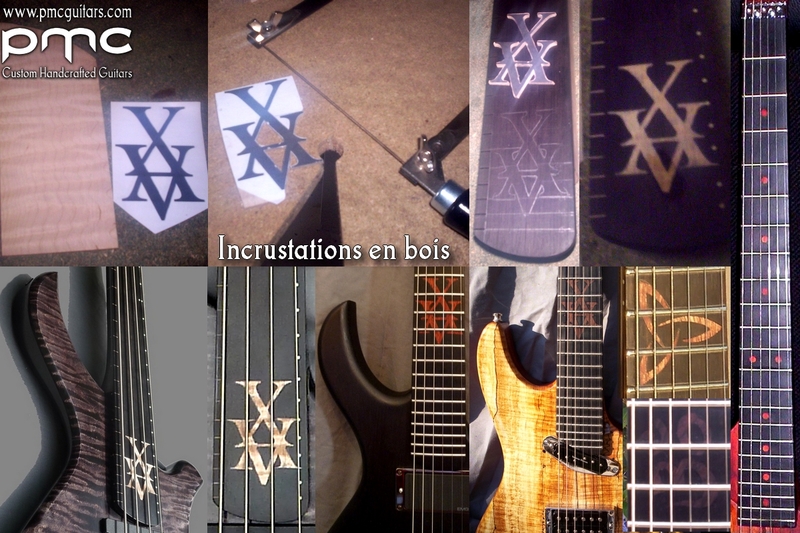 – “Custom” means that evrything is possible. 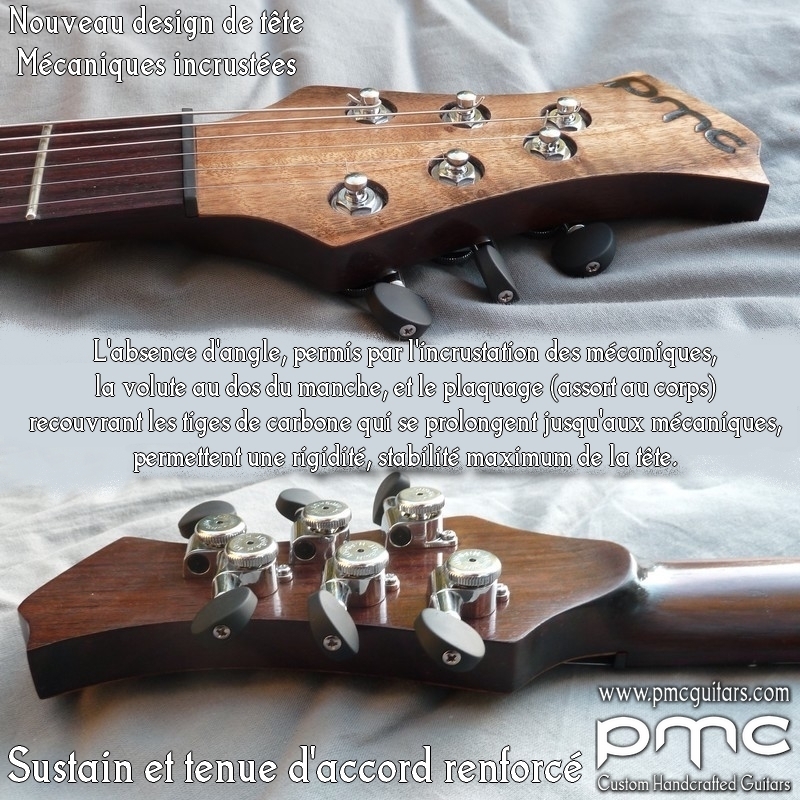 You can select both woods and colors, and you can also have your own shape as well as an entire new instrument concept. 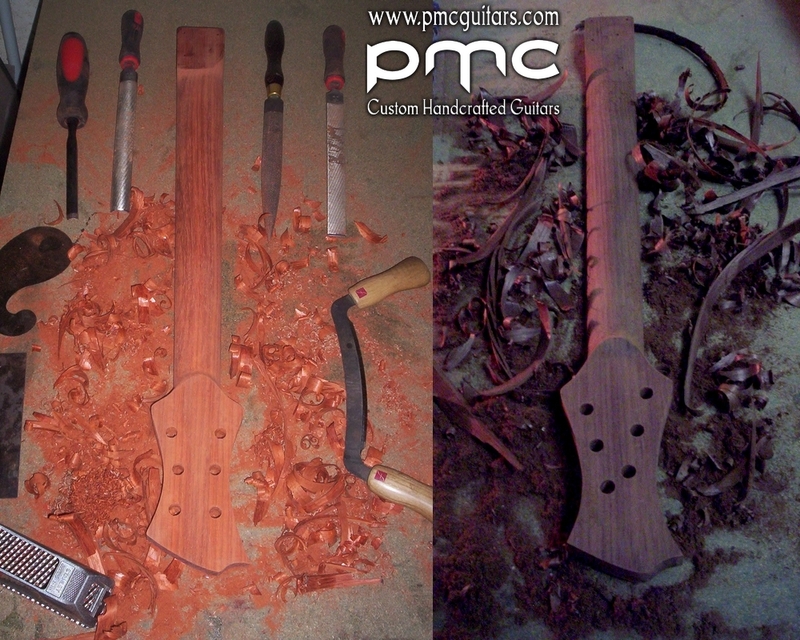 – “Handcrafted” means that instruments are built by me alone with my own two hands. 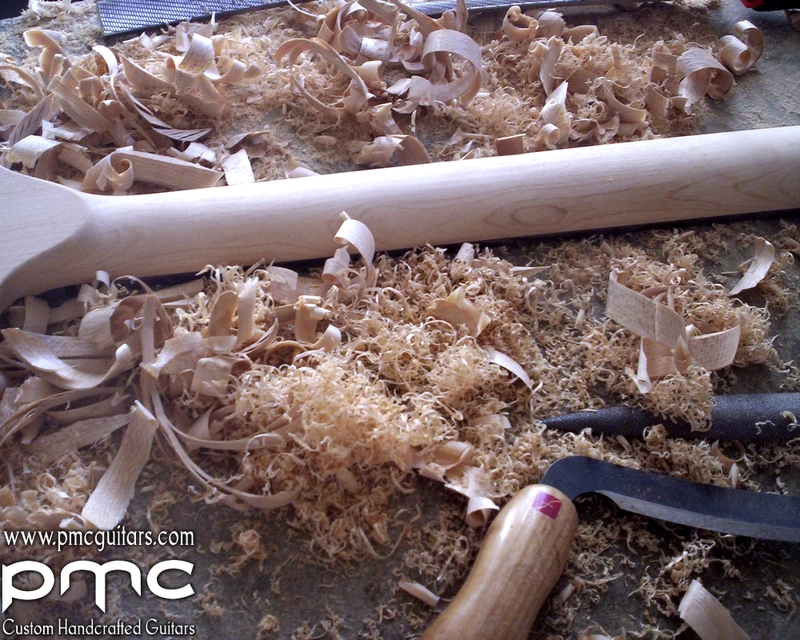 Of course I use wood machines, but they are simple traditional woodworking machines, therefore no CNC machines that work all alone. 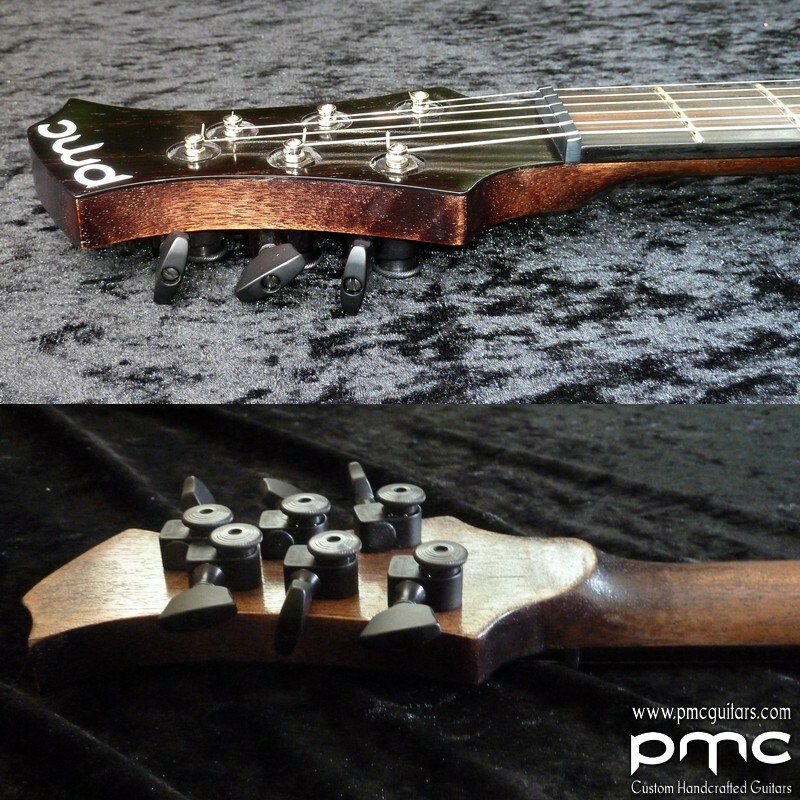 – All necks are equipped with a “spoke nut” dual action truss rod and two carbon fiber rods. 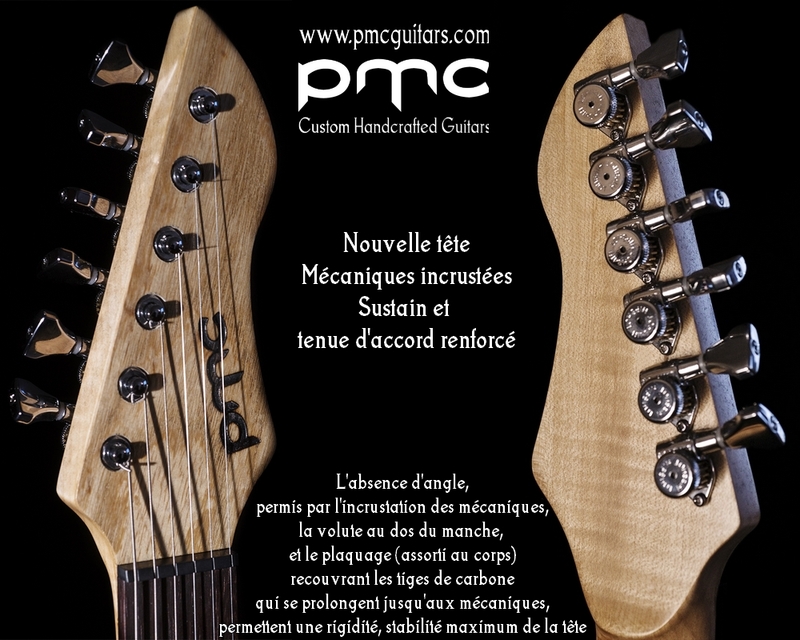 – They are hand carved and perfectly designed for the musician’s hand. 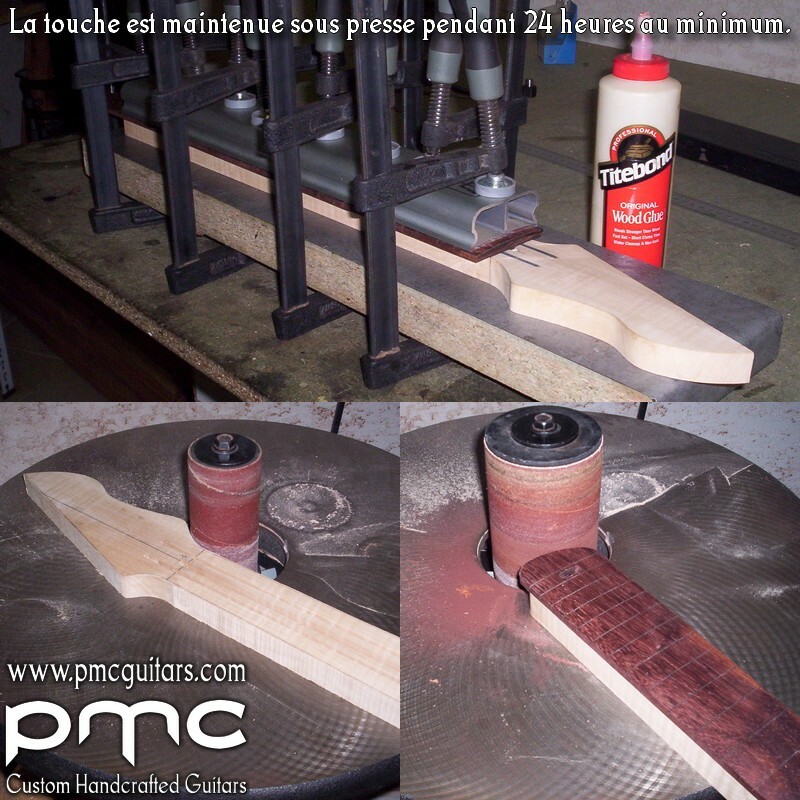 – The fingerboard is to press for 24 hours minimum. 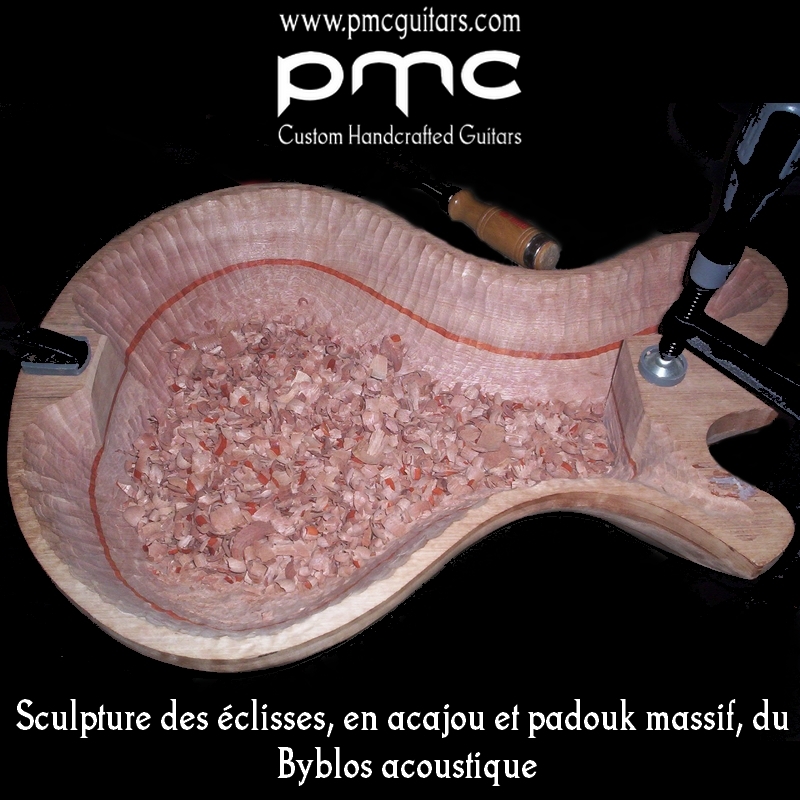 – Also hand carved are the nuts, made of bone or Tusq. 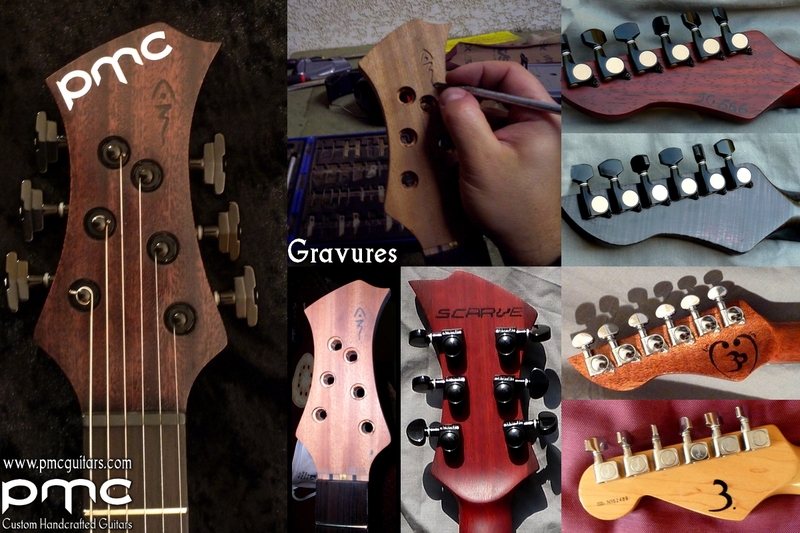 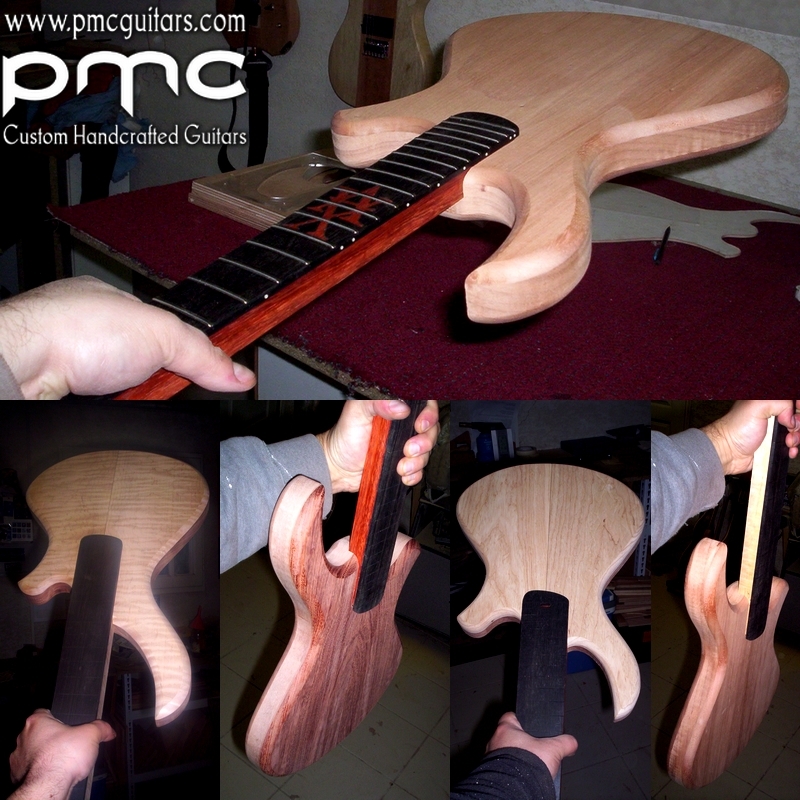 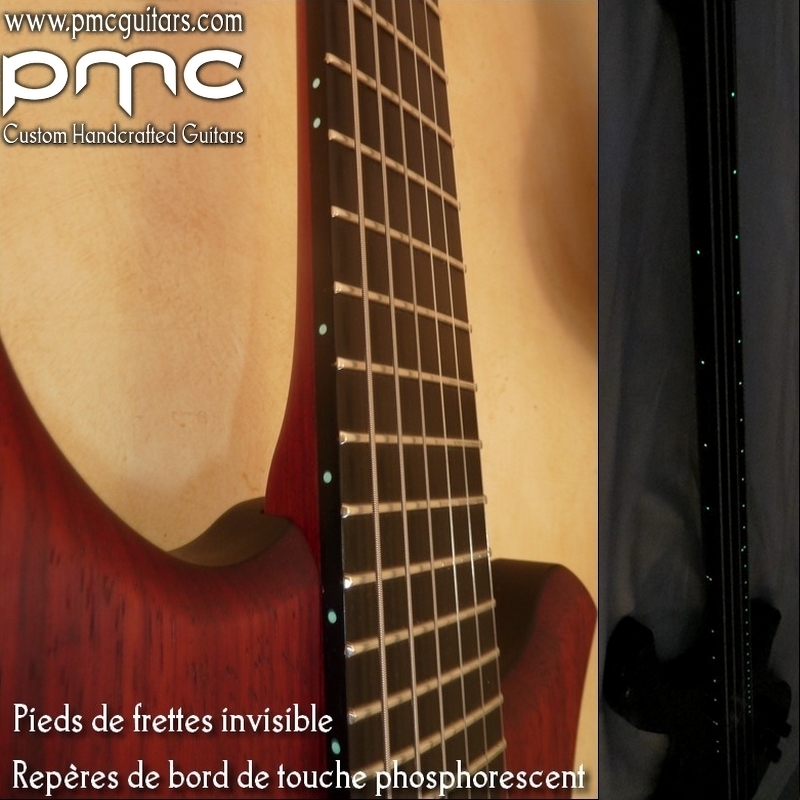 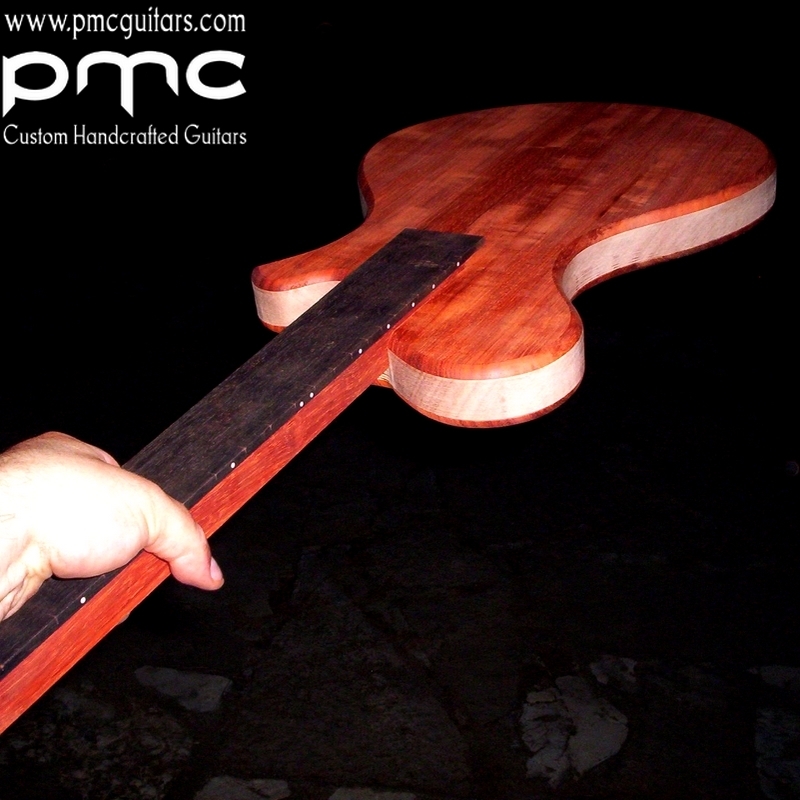 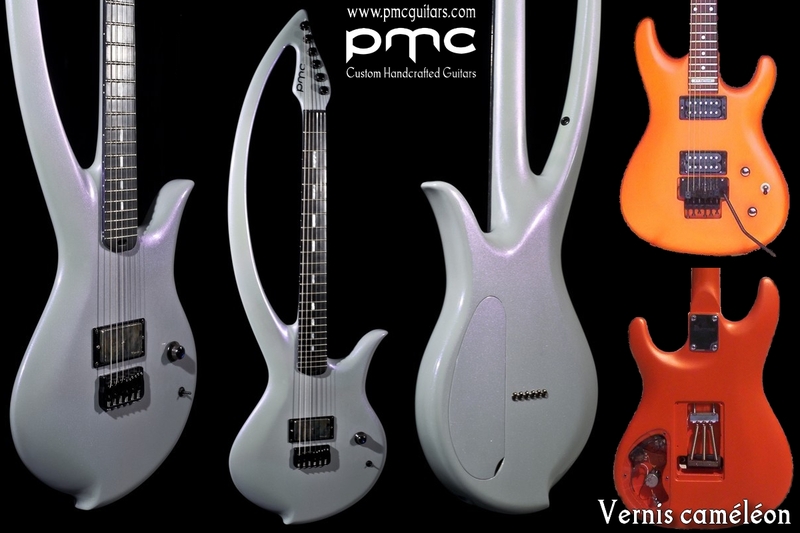 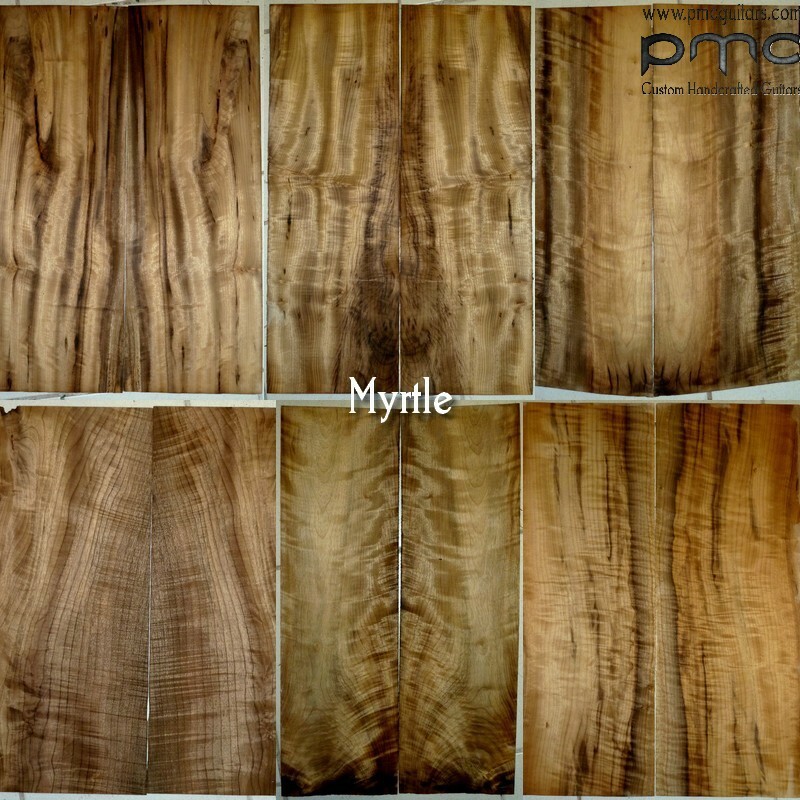 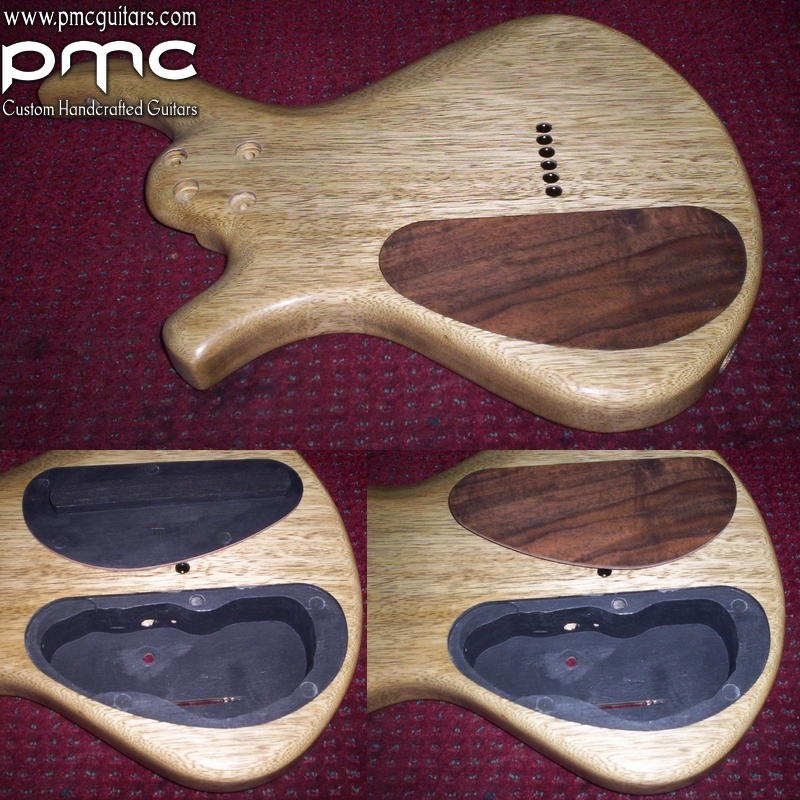 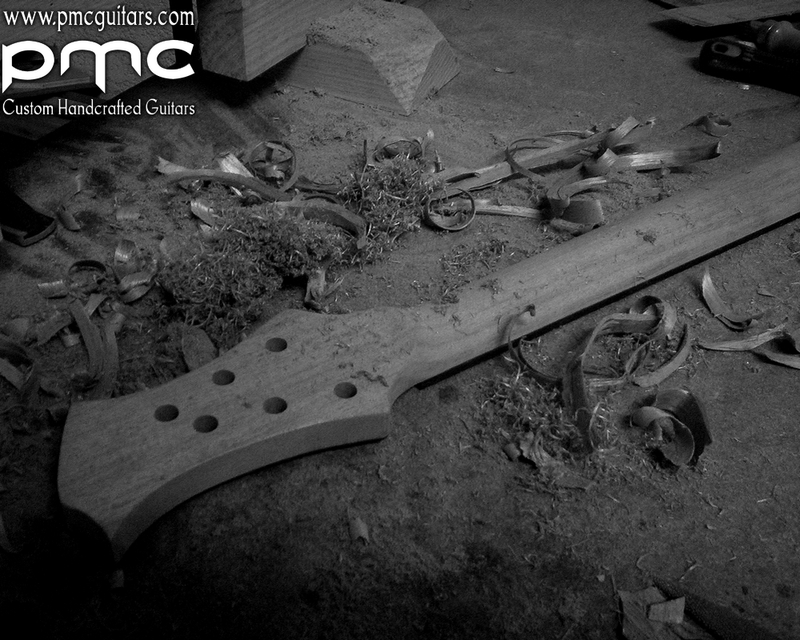 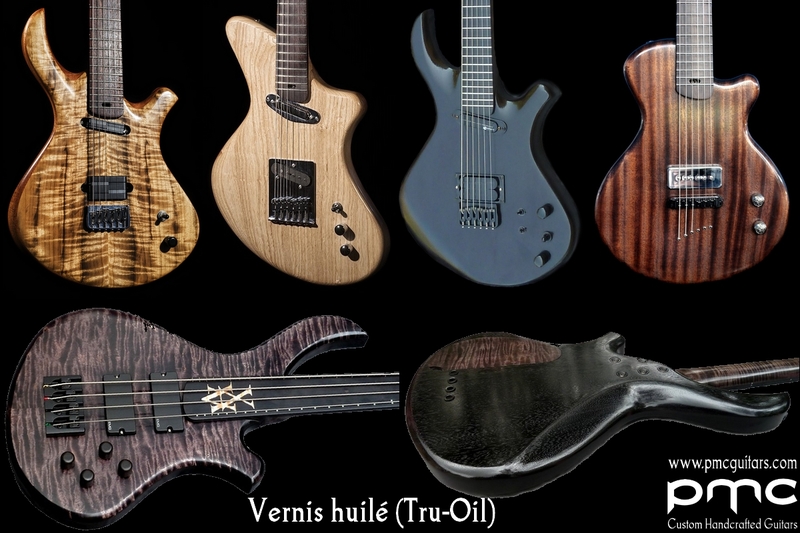 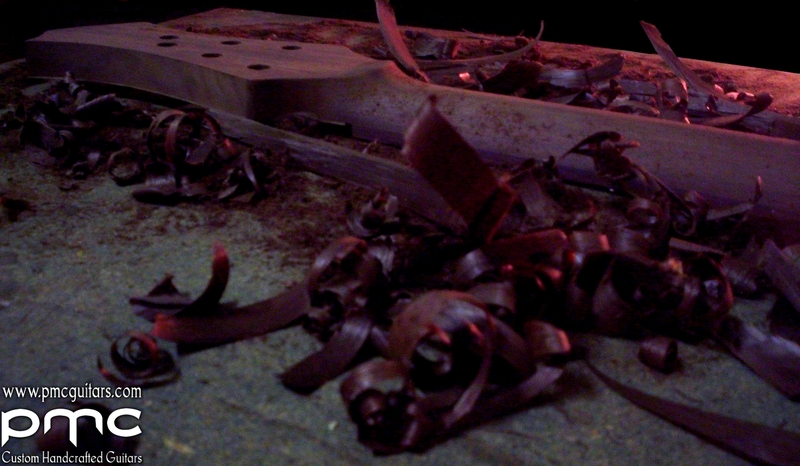 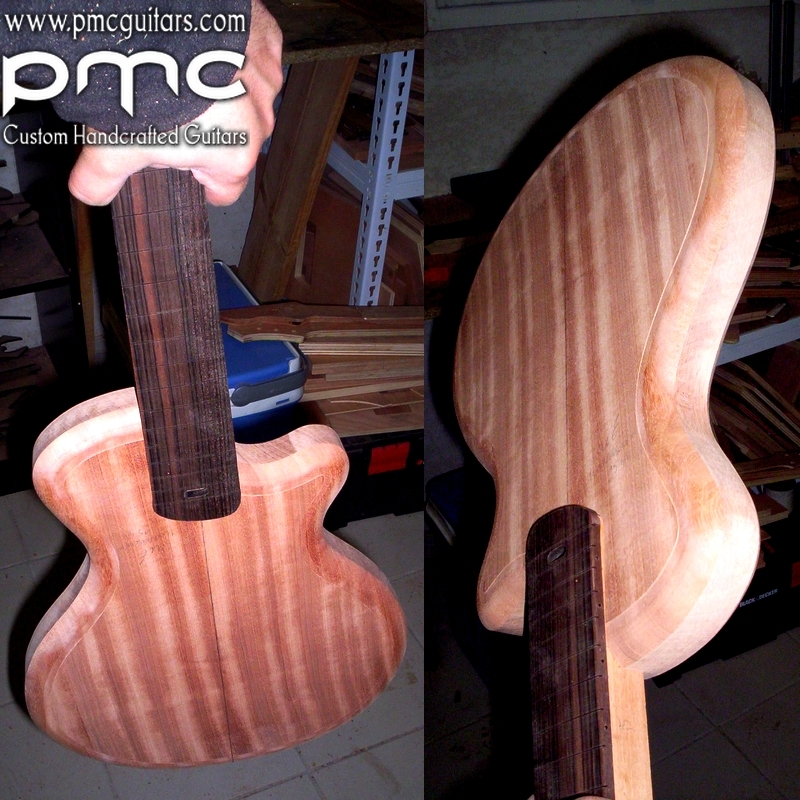 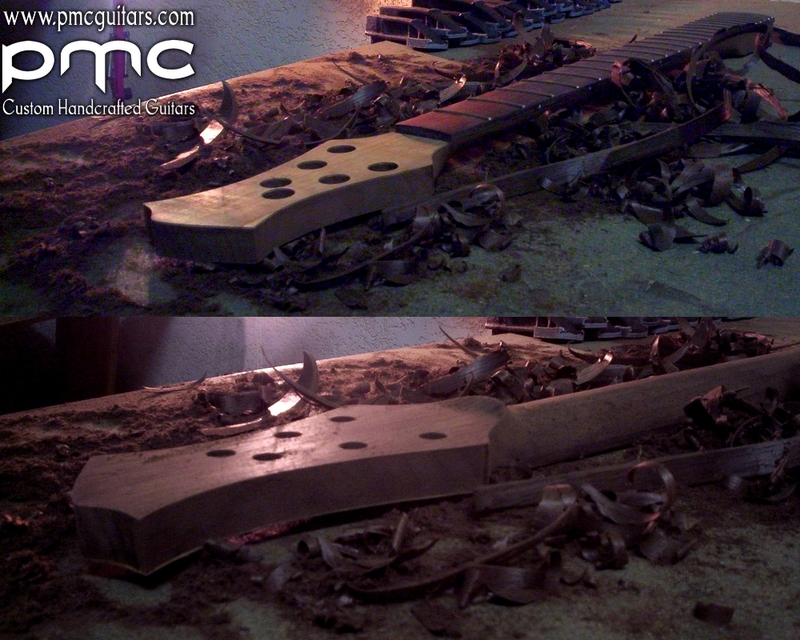 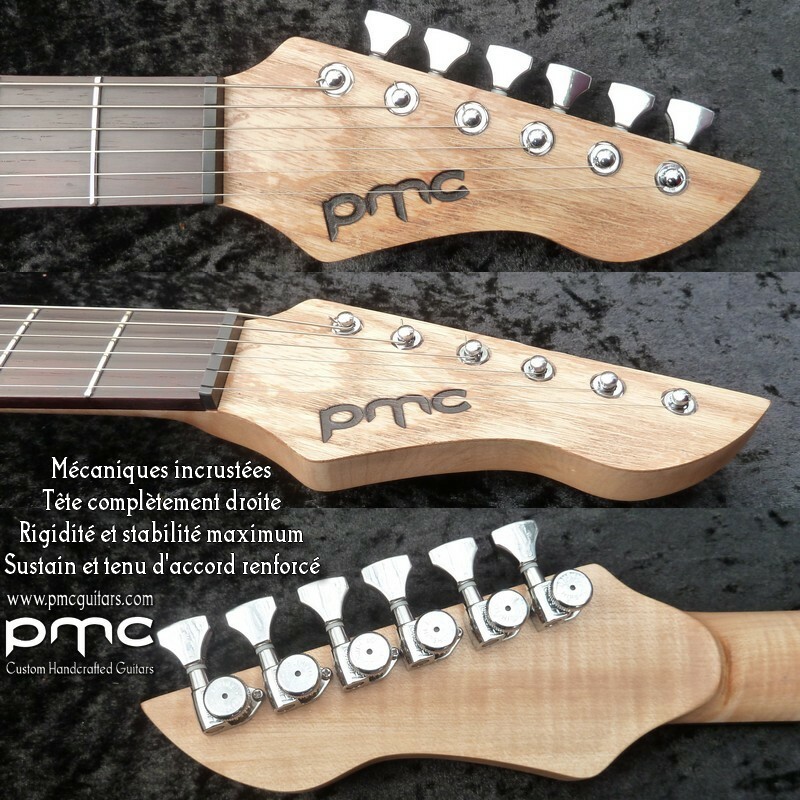 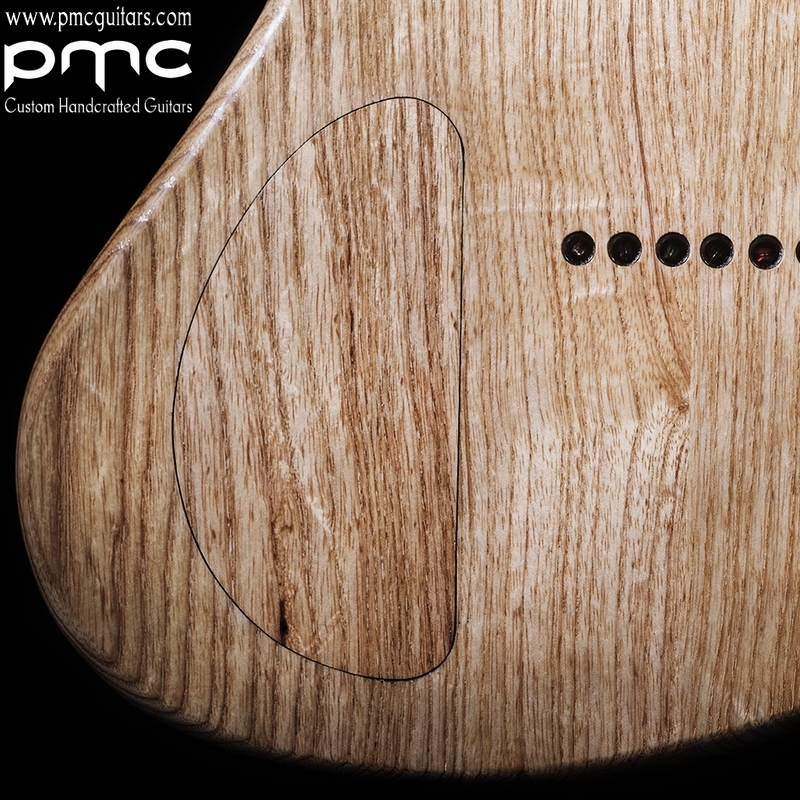 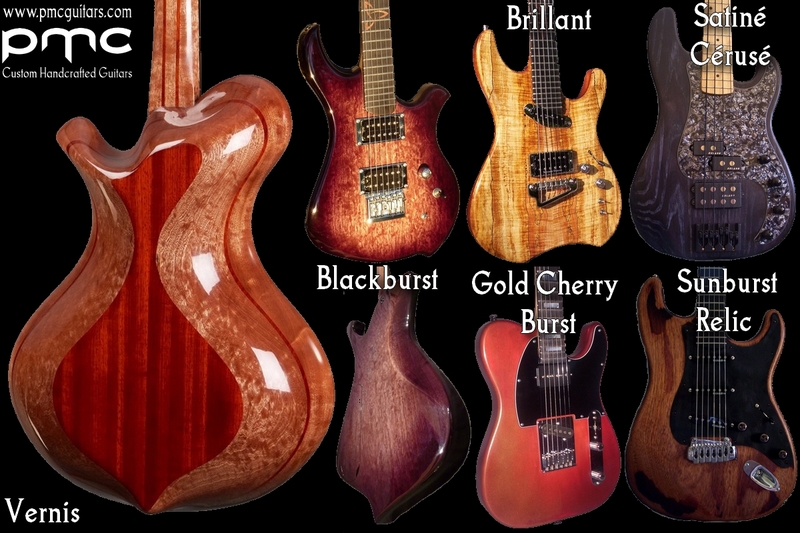 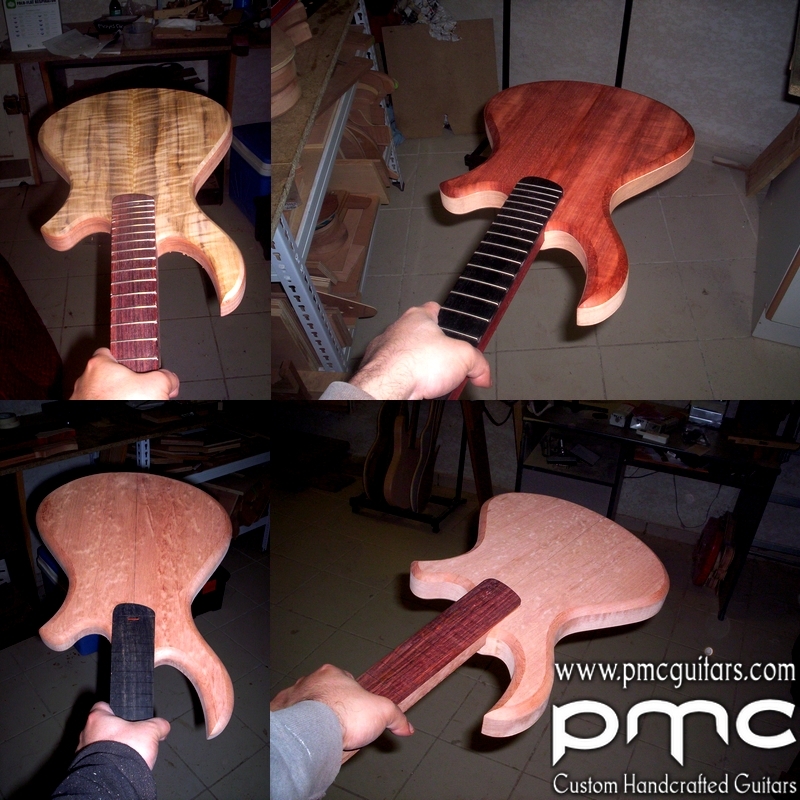 – Since 2013 I have improved the way of making necks of PMC guitars. 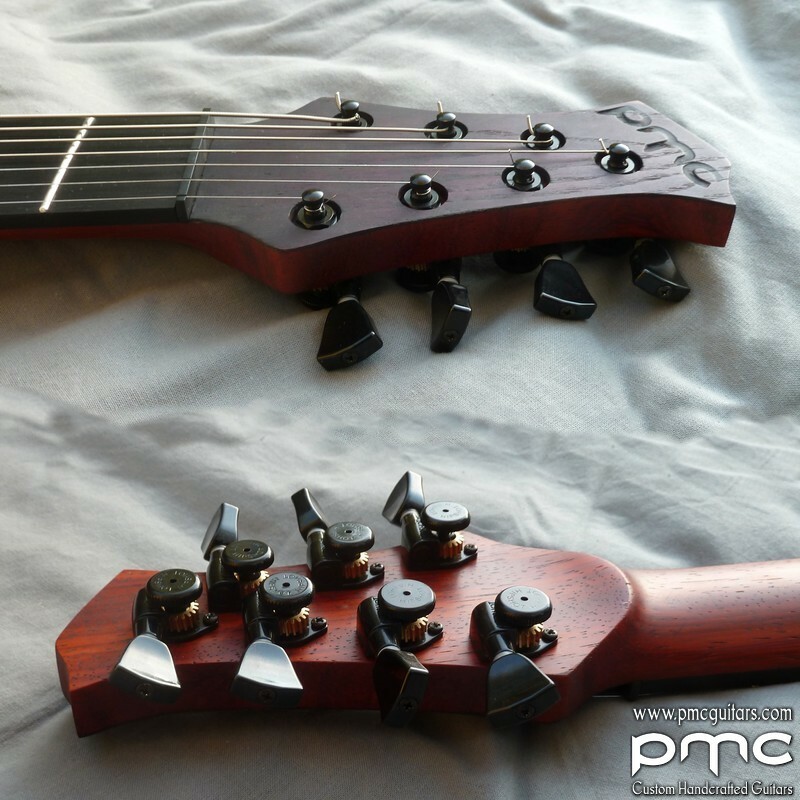 From now on the head is completely straight, strengthened by a headplate and by carbon rods which run from the heel to the tuners. 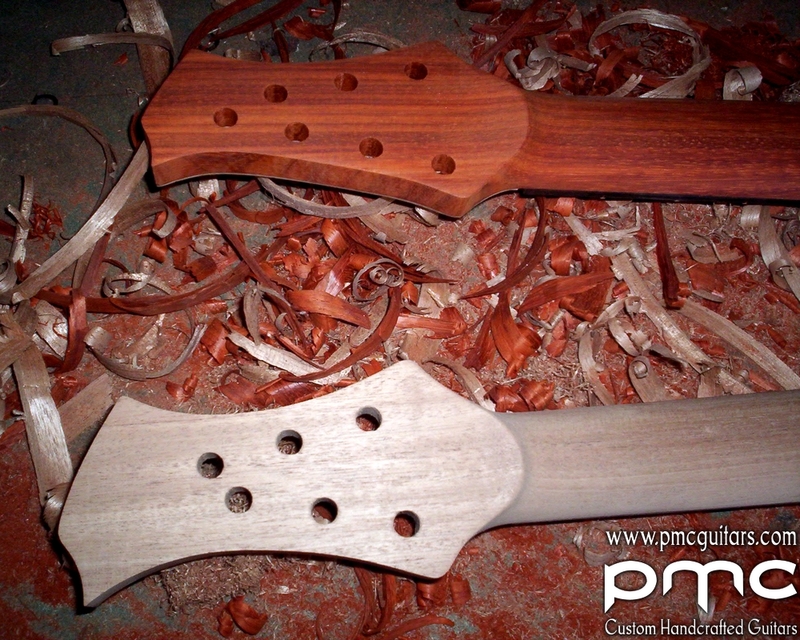 The tuners are inlayed to optimize the angle on the nut. 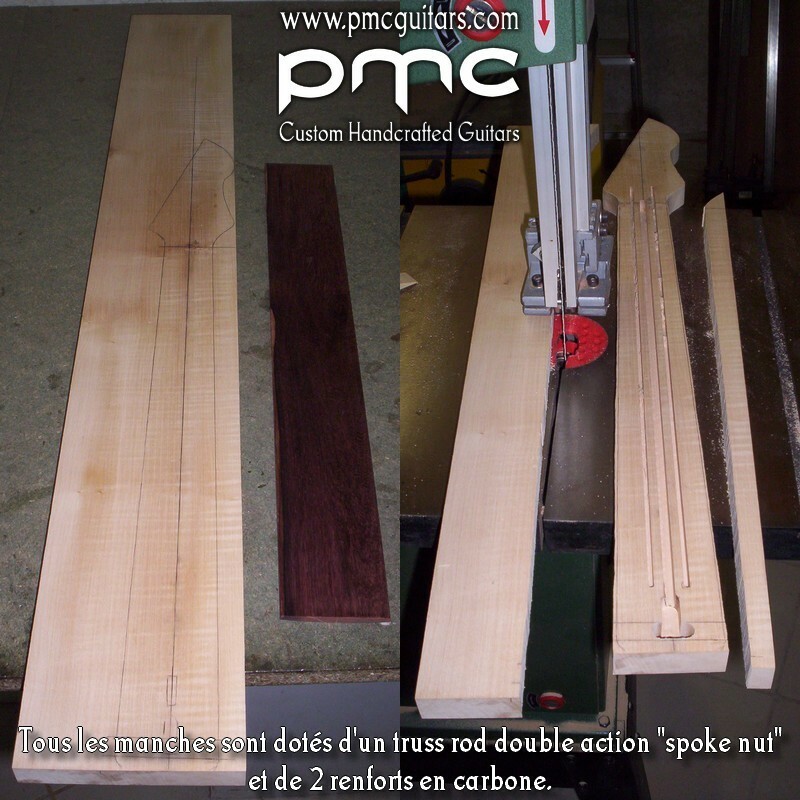 The access to the spoke nut truss rod is made by the heel between the two last frets. 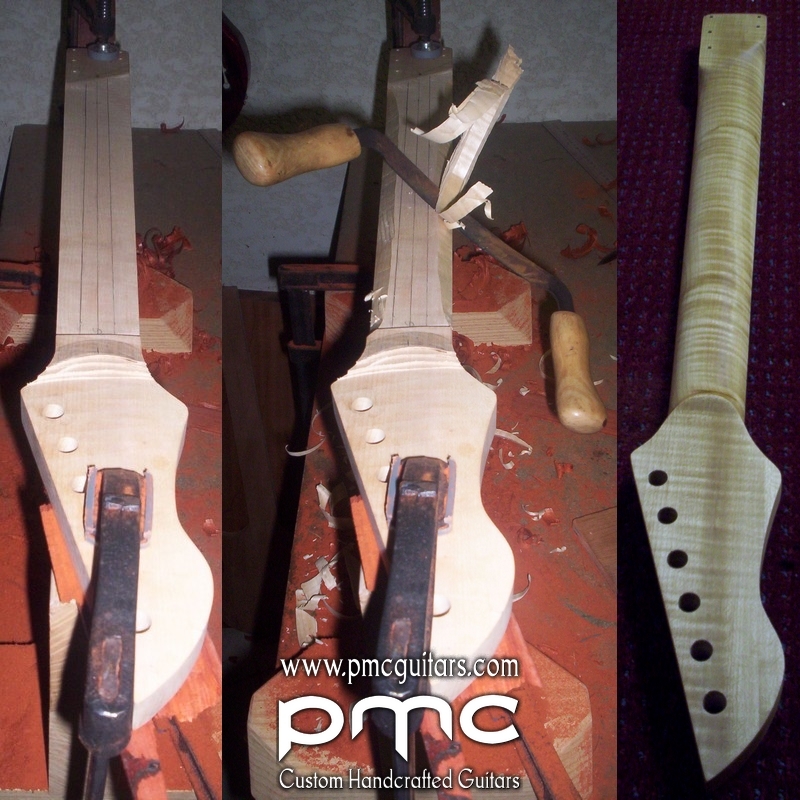 Therefore on the head, the thread of the wood is not cut after the fingerboard, there are no cavities for the truss rod and the head is thicker. 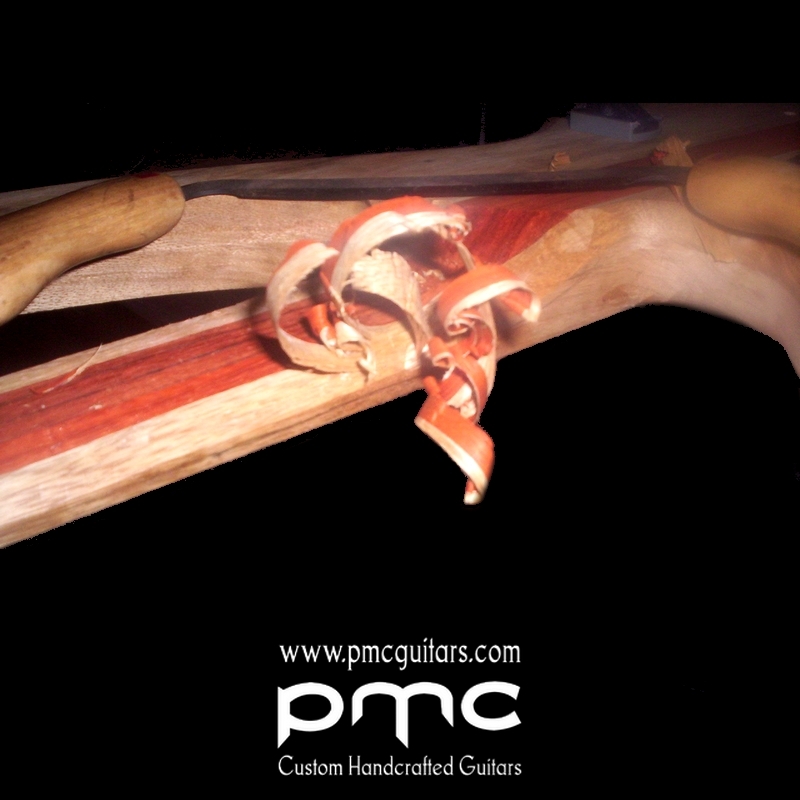 It gives a maximum of rigidity and thus of sustain, as well as tune stability and it minimize the risk of fractures. 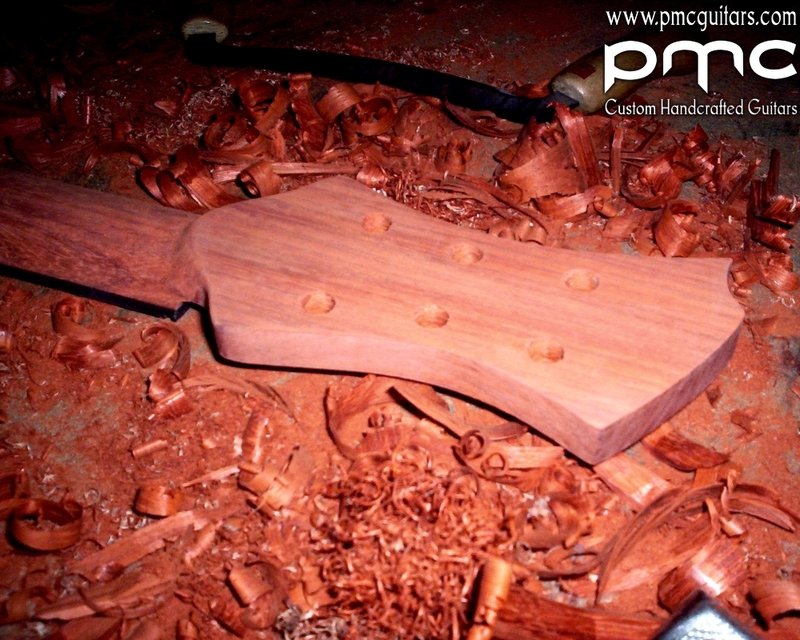 One of the major elements of the guitar manufacturing process is the neck joint. 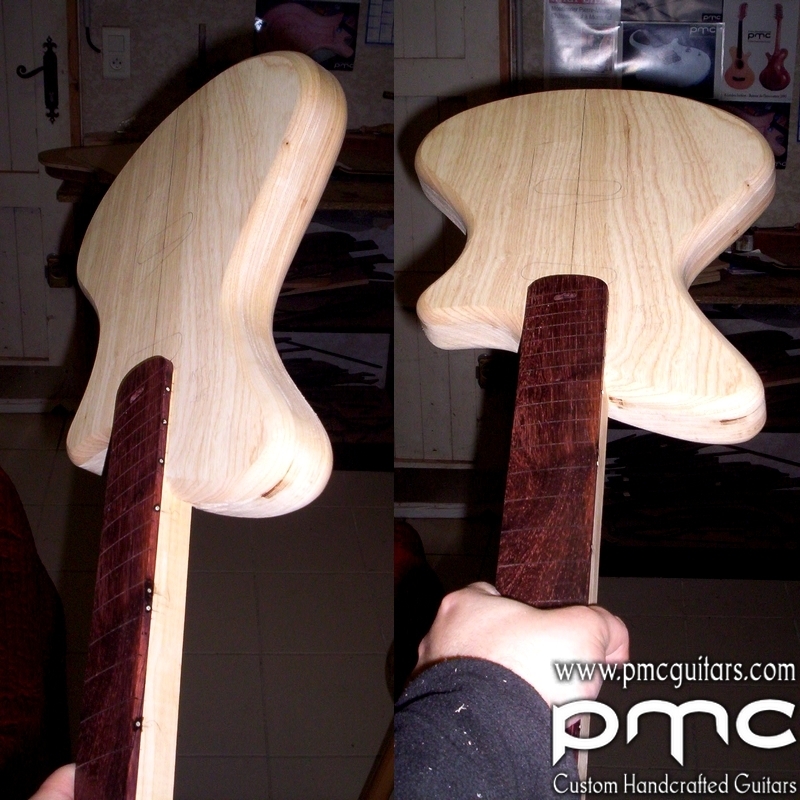 This neck pocket is done very carefully so that, even without glue or screws, the neck is perfectly fitted to the body. 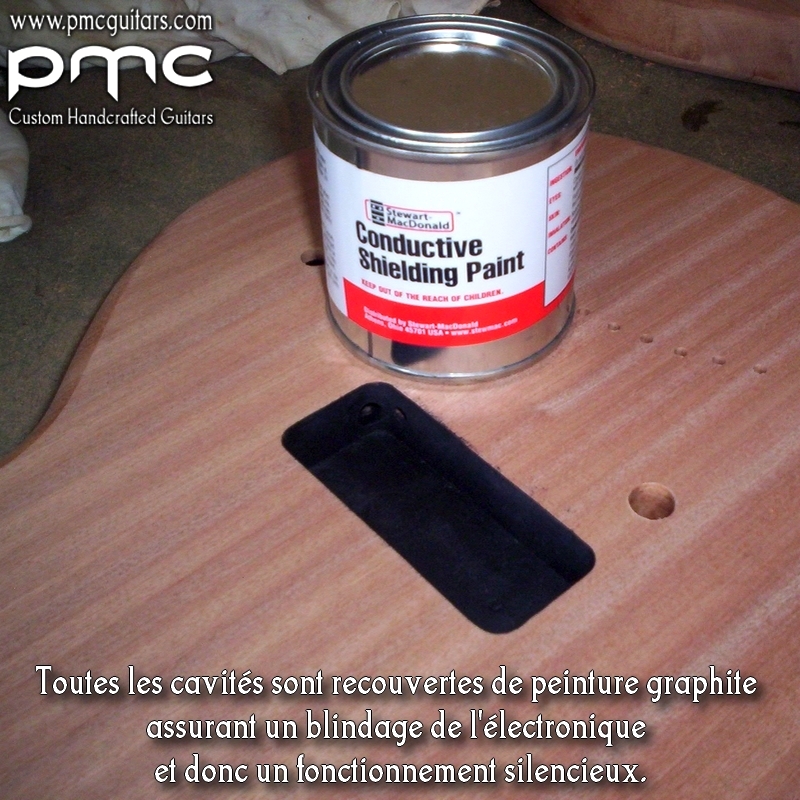 – For the sake of esthetics and ease of access, control cavity cover plates are made of wood and are magnetised. 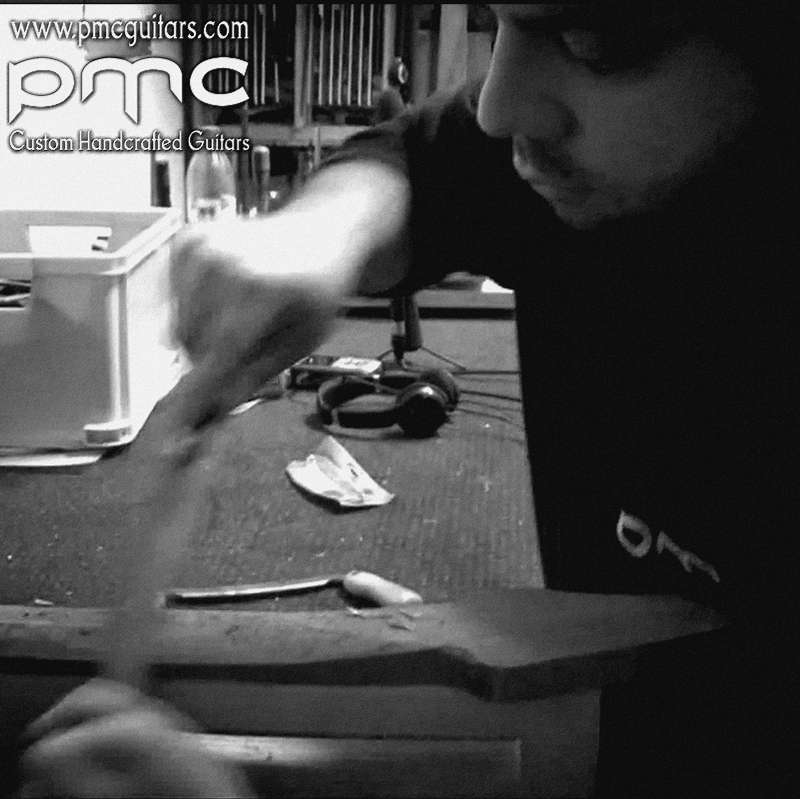 Thus, for example, no tools are required to change the batteries. 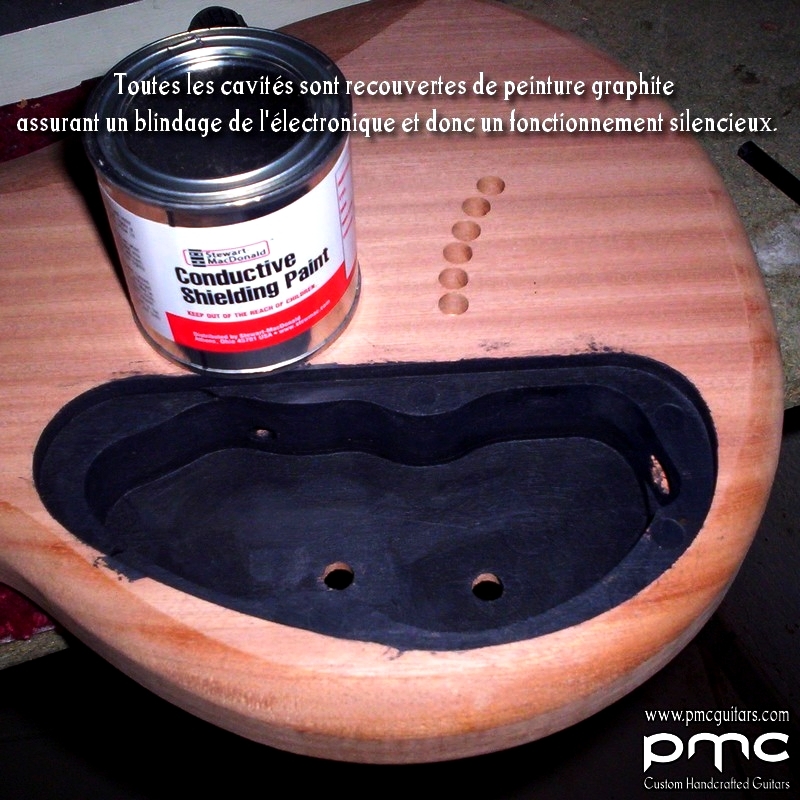 – All cavities are coated with conductive protective graphite paint which secures the electronics and reduces noise hum and radio interference. 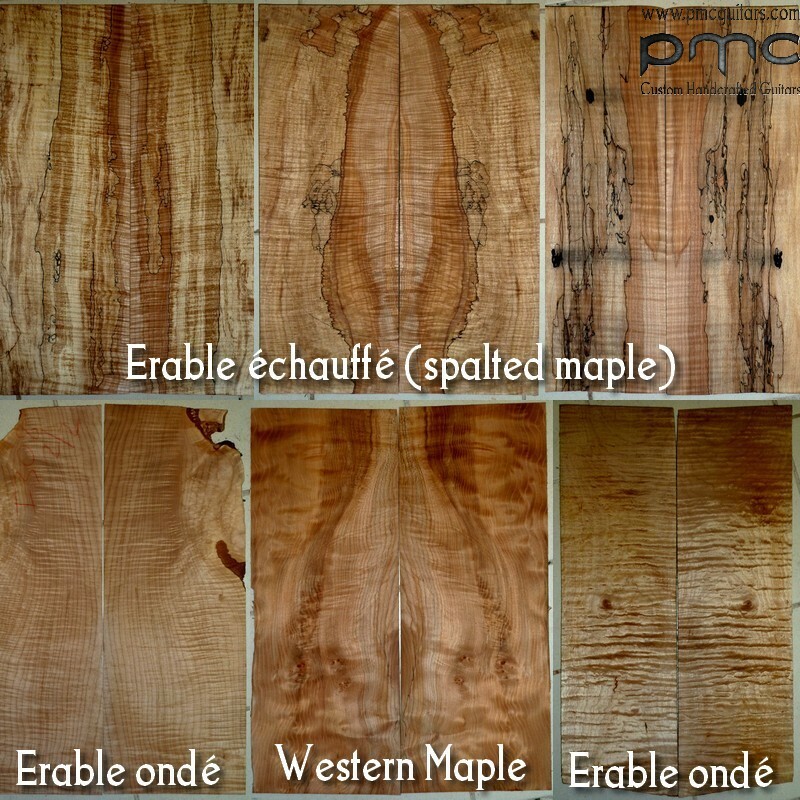 All kinds of finishes are possible. 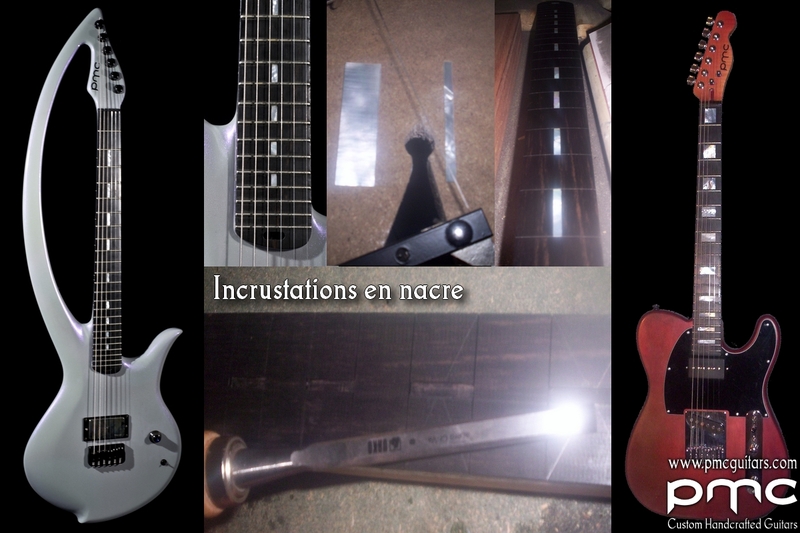 – finally, it is less expensive, which affects the final cost of the instrument. 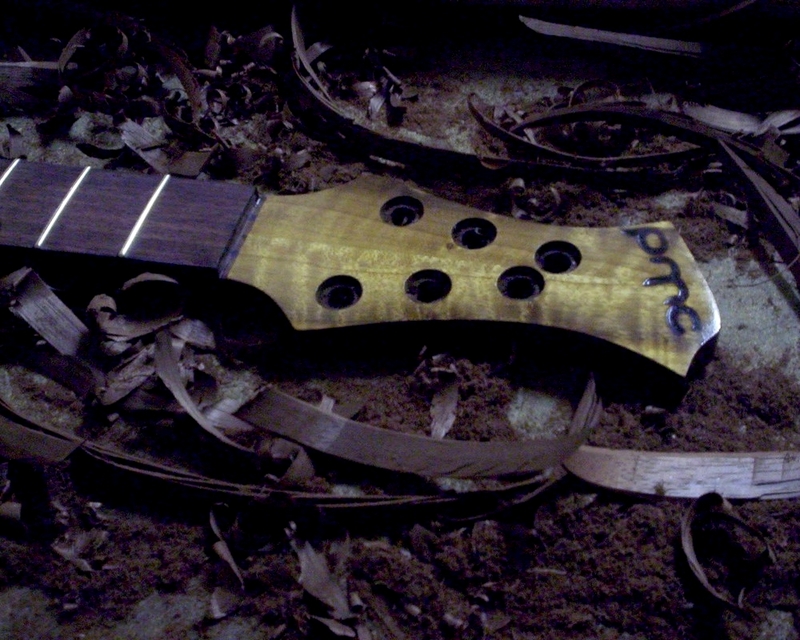 This is the best way to personalise the instrument. 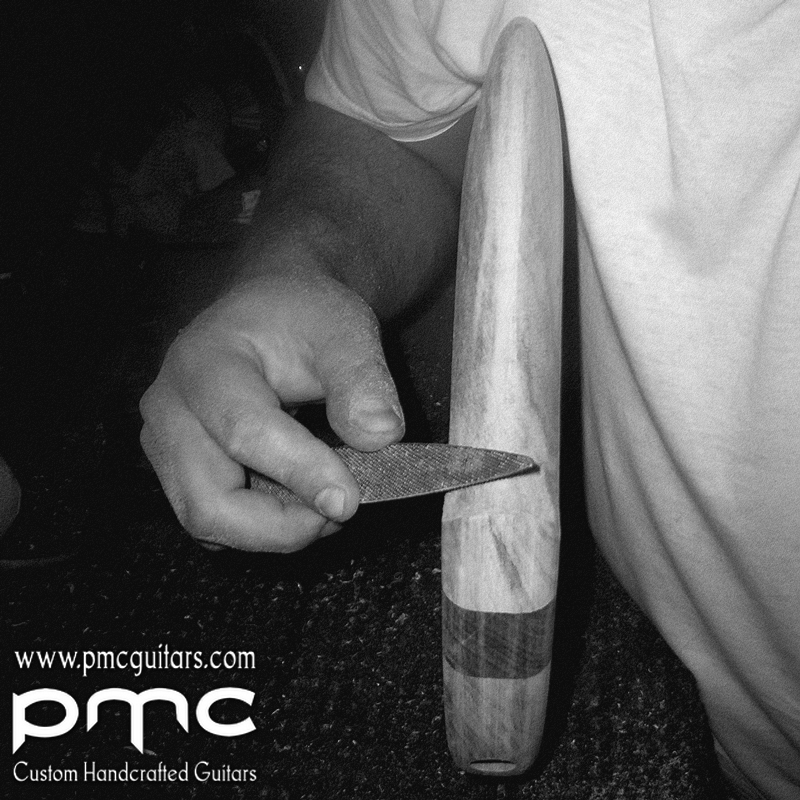 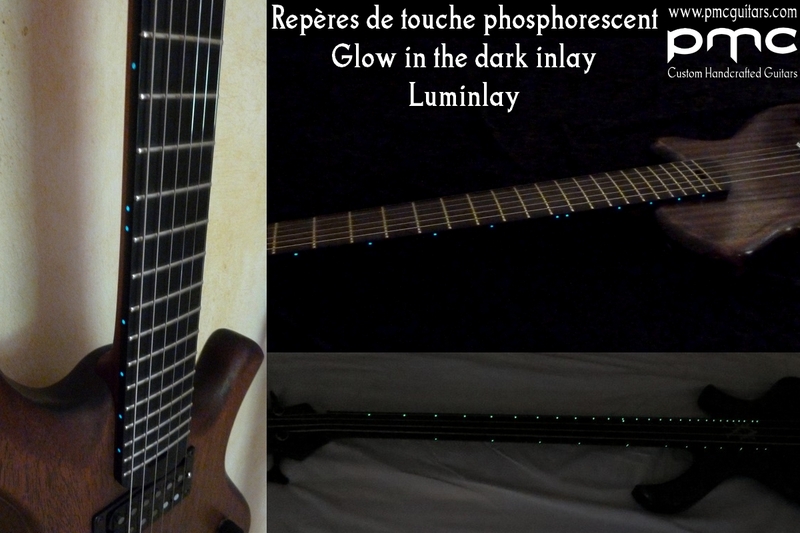 The inlays are traditionally placed on the fingerboard or peghead, but anything is possible. 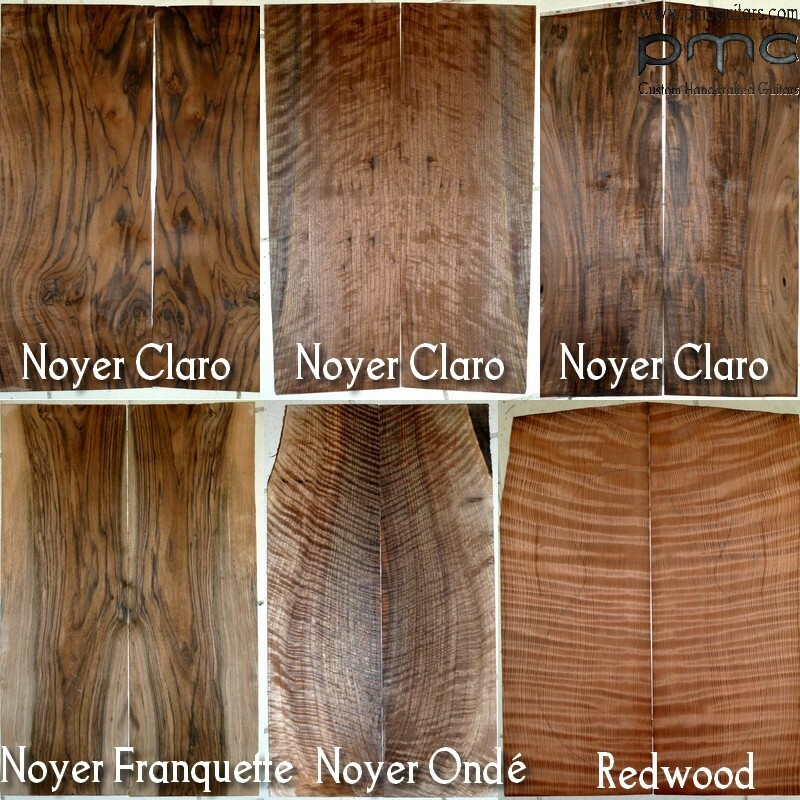 I prefer wood inlay, often more discreet and original than the abalone inlays. 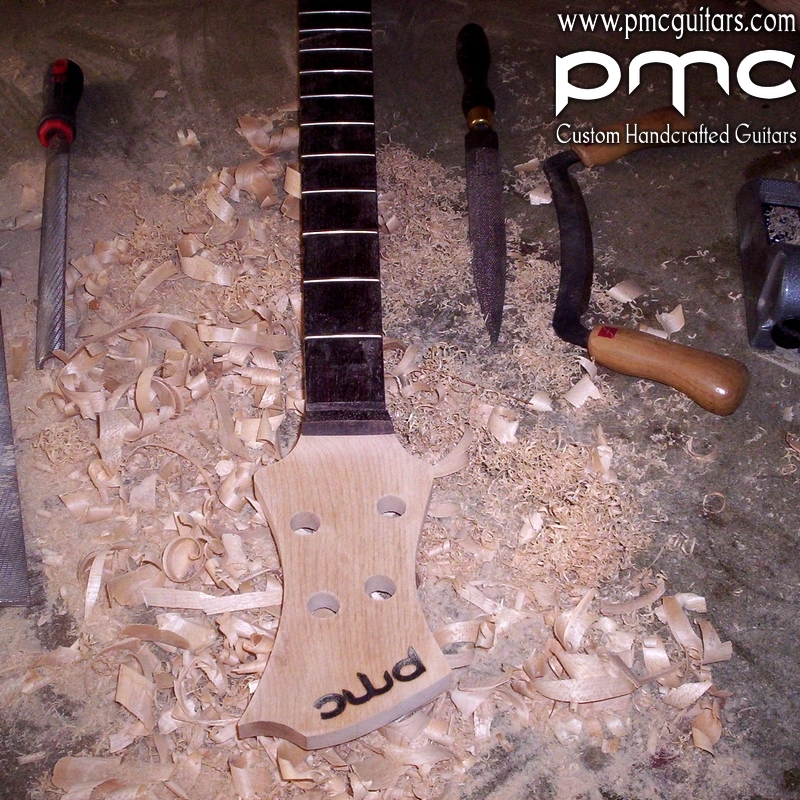 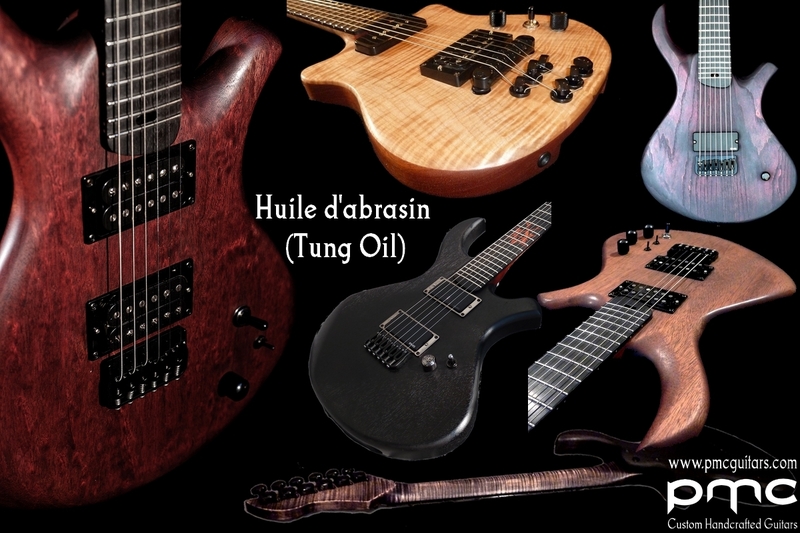 In addition, they are more in harmony with the instrument when using neck wood to inlay the fingerboard for example. 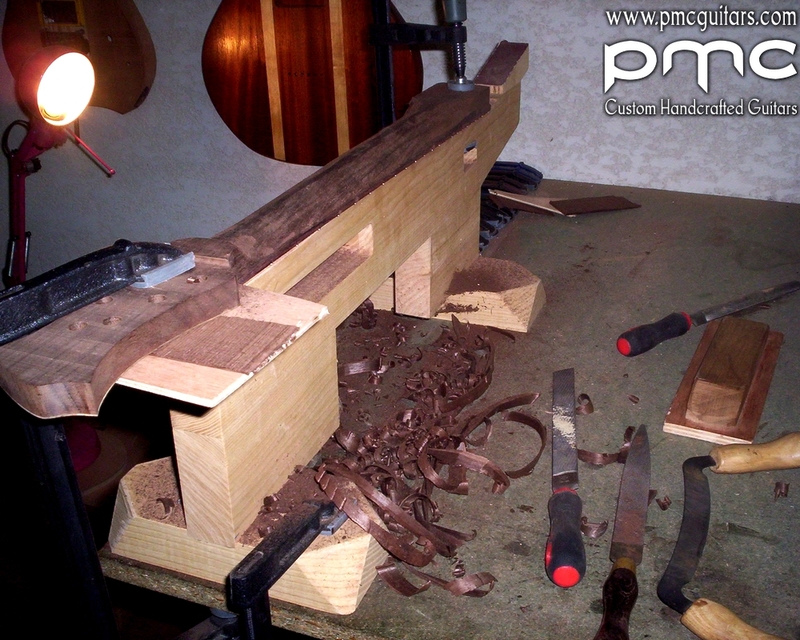 – The air conditioning of the workshop (reversible) maintains the ideal temperature and humidity throughout the year. 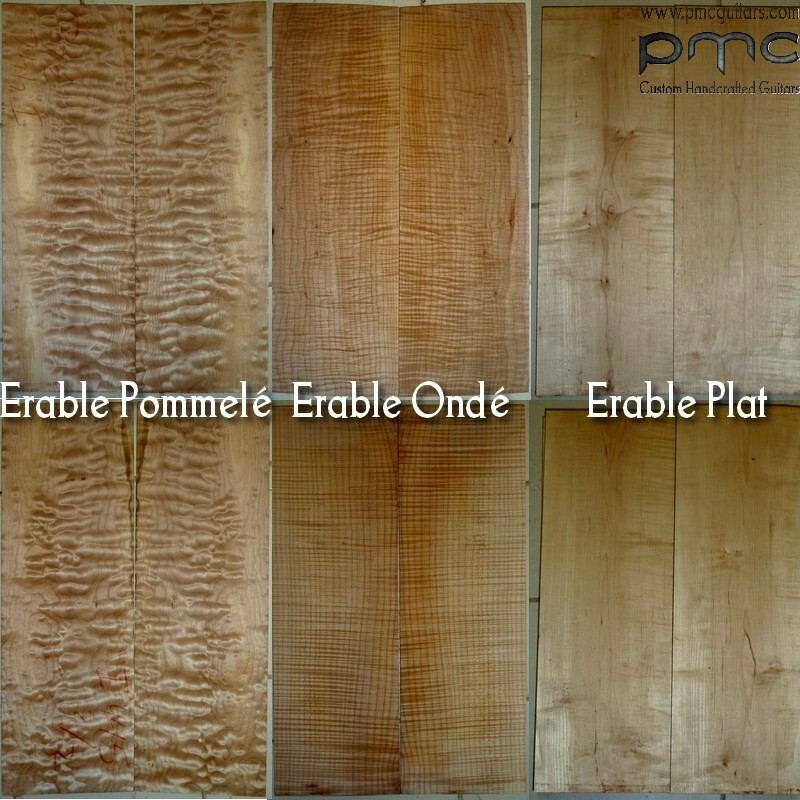 Therefore wood gluing is made under optimum conditions. 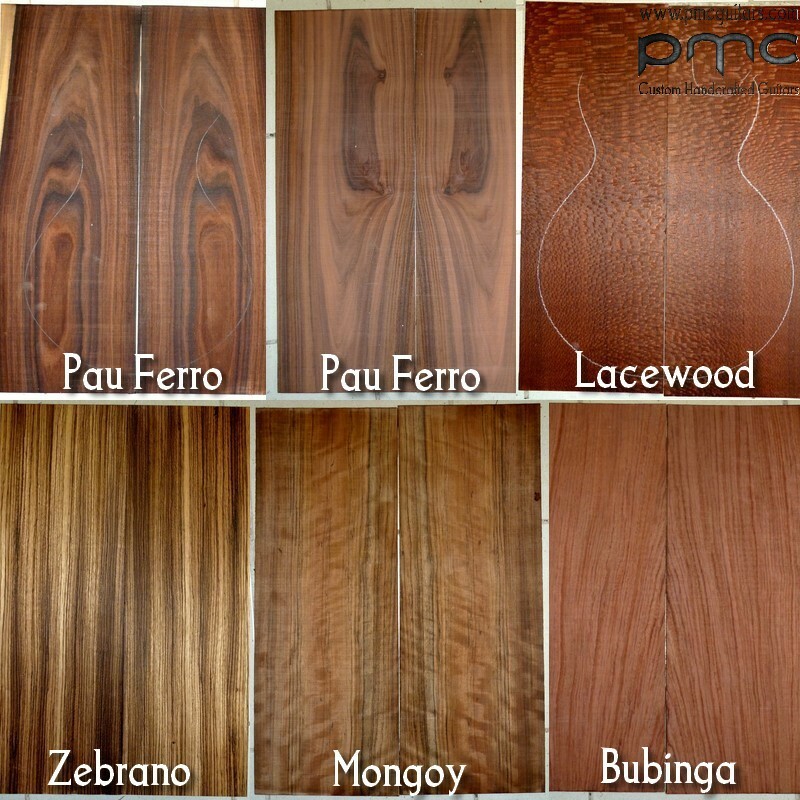 And wood species, selected with great care and stored in the workshop for several years, are fully stabilized. 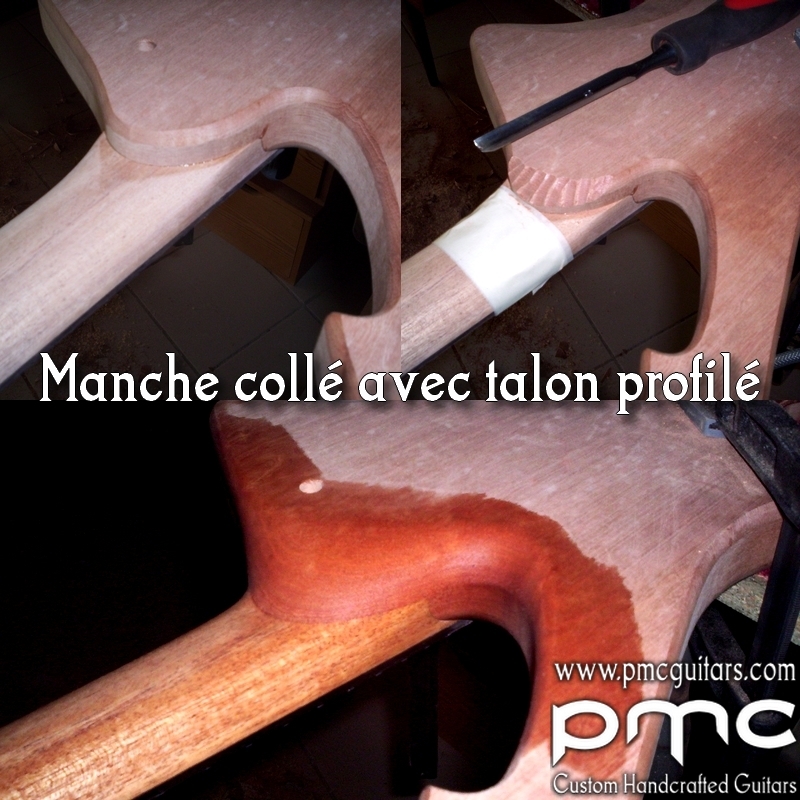 – I work one-on-one with my clients throughout the whole process, which includes in particular sending e-mails & pictures at every step of the entire process. 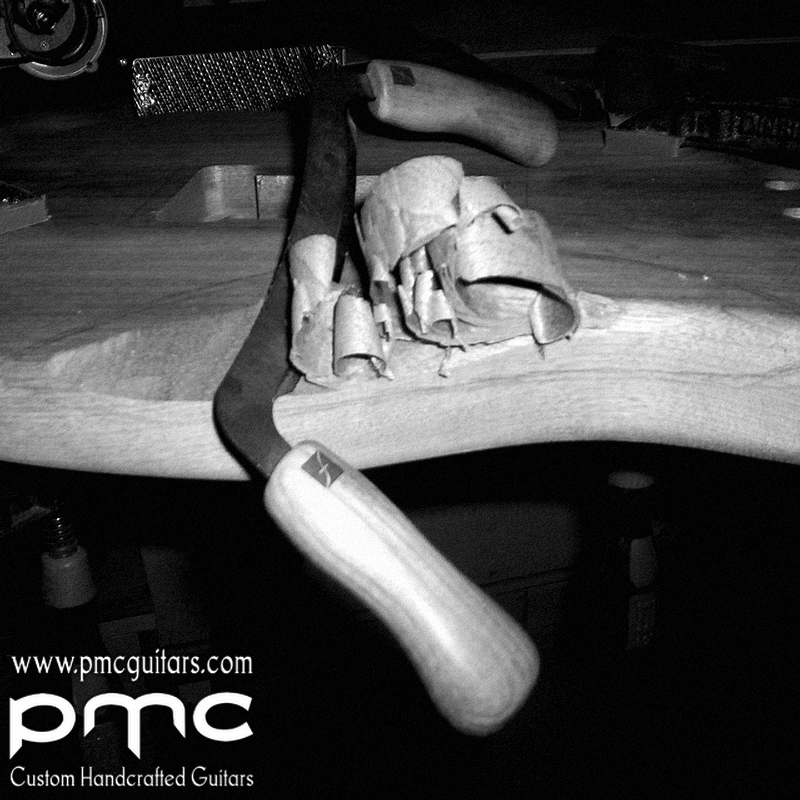 – In order to fully meet customer expectations, there is a continuing dialogue with the craftsman (me) acting as an advisor generating options. 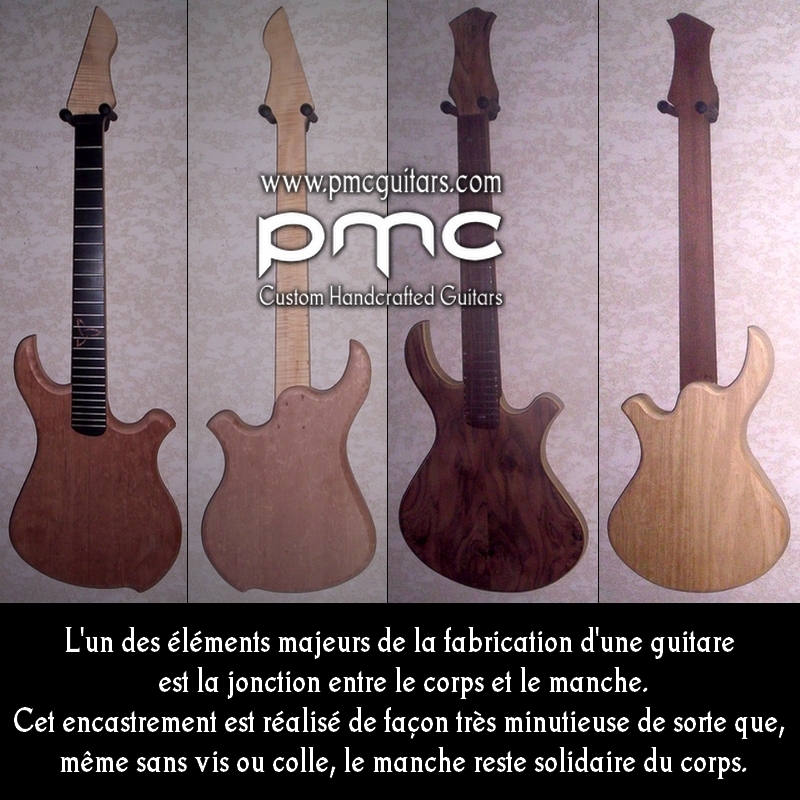 – Instrument bodies are guaranteed for 3 years, while the necks are guaranteed for life. 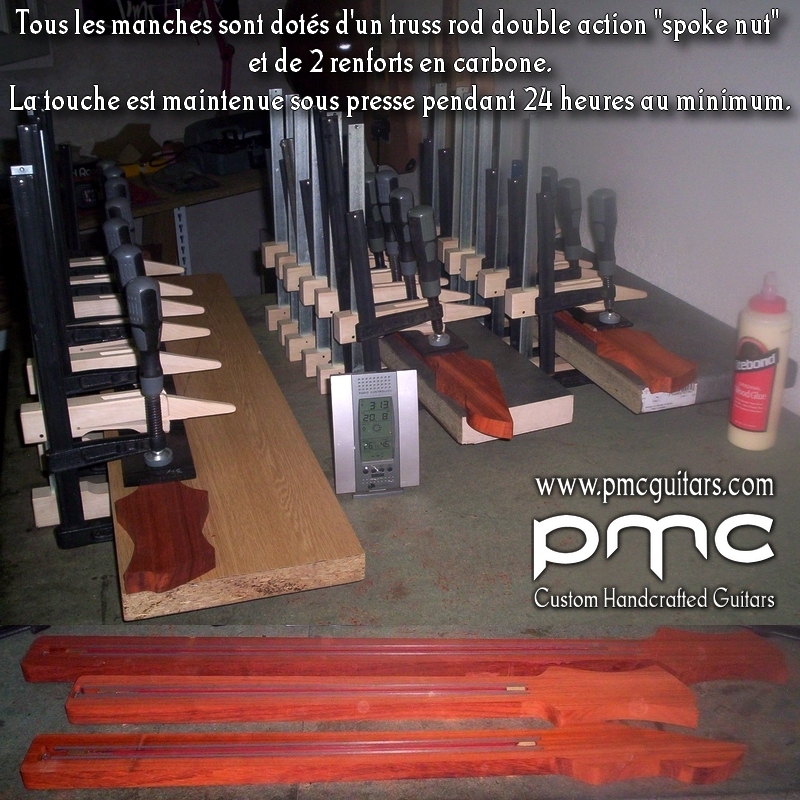 All other guarantee details will be sent together with quotations. 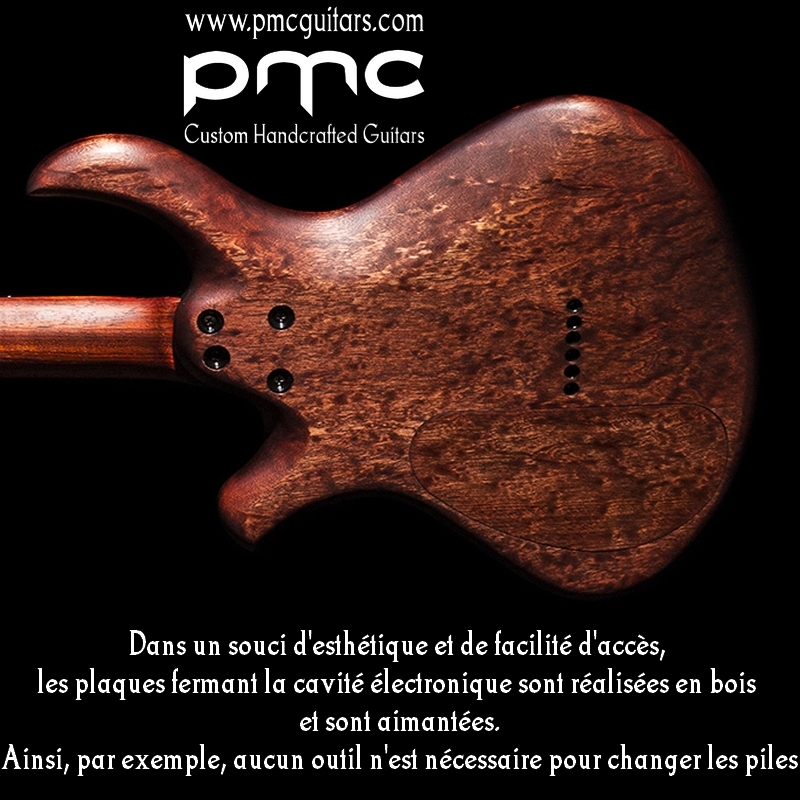 – Each guitar is delivered with a PMC Tee shirt & a CD Rom presenting photos of the various steps of its manufacturing process.